Who Said There’s No Street Food in Montreal? Not so long ago, Montreal’s food lovers were brooding over the city statute that prevents food trucks from operating freely. The bylaw—which was adopted in 1947 to ensure hygiene standards and protect the city’s restaurateurs against “unfair competition”—forbids the serving of street food except at a festival or special event that closes a street to vehicles. Those against the rule say that it’s obviously obsolete and it’s unreasonable that a major city like Montreal can’t hop onboard the food-truck trend, like so many other North American cities have. Those who support the legislation are happy that hundreds of hot dogs and pretzel stands aren’t dotting the streets and parks of the city. But the law hasn’t been enough to stop some restaurateurs from equipping trucks of their own and finding ways to feed gourmands on the run. 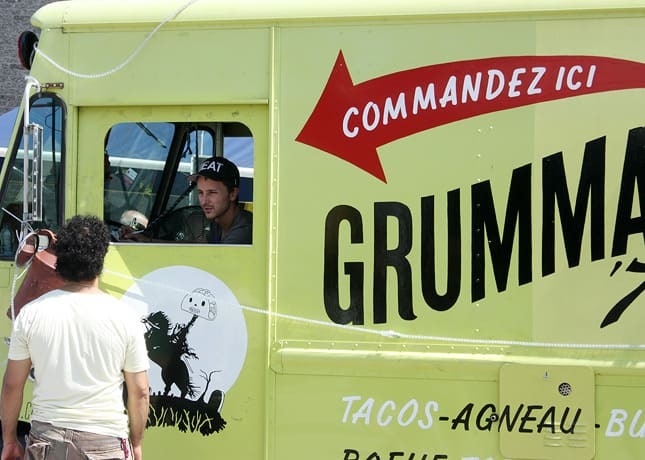 The leader of the covert food-truck movement is a truck named Grumann ’78, which started serving tacos out of a kiosk shaped like a truck’s service window at a church basement flea market. This was just a year ago, in the summer of 2011. Since then, the Grumann ‘78 truck has been seen at all of the city’s major festivals, and their success has encouraged many others to follow in their footsteps. Mind you, the people behind Grumann’s savory tacos aren’t nobodies: the chef, Marc-André Leclerc, has worked in some of the city’s best restaurants, including Toqué and Au Pied de Cochon, at his partner Gaelle Cerf was the long-time manager of Au Pied de Cochon. 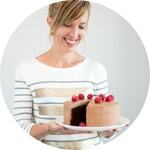 The team also includes Hilary McGown, who worked in high-end restaurants before realizing that “tacos were her ticket to happiness.” These three gave Montreal’s street-food movement the credibility and strength it needed to push the city’s elected representatives into thinking that maybe it was time to amend that 1947 bylaw. Grumann ’78’s iconic lime green truck. 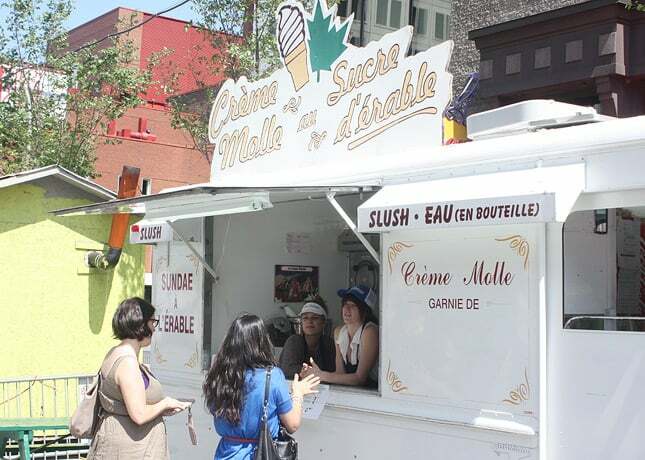 Although the legislation hasn’t been changed yet (the city says it’s likely new rules regarding the street sales of food could be out by fall), food trucks are not a rare sight this summer. 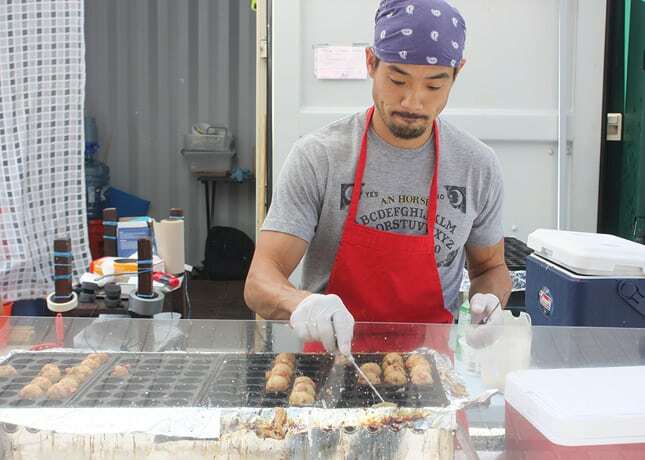 Trucks gather on the esplanade of the Olympic Stadium on the first Friday of every month, and more and more festivals are hosting food-truck events. The biggest and most interesting gathering, called “The Souk”, was organized by Grumann ‘78’s Gaelle Cerf for the Just for Laughs festival. 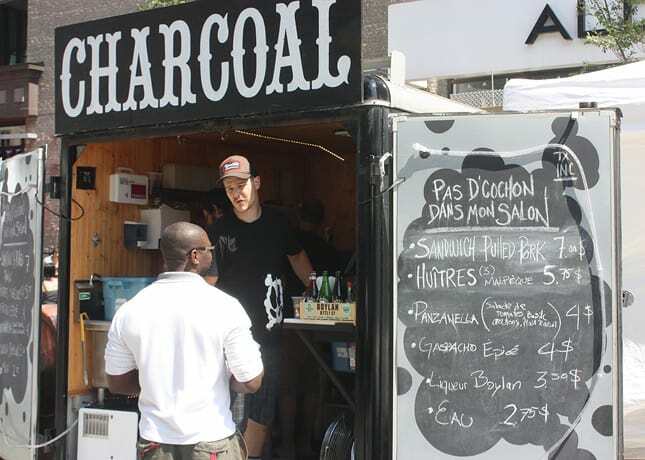 For over two weeks, a portion of one of Montreal’s liveliest streets, St. Catherine, hosted more than two dozen food vendors who catered to hungry festival goers and happy street-food enthusiasts. I was lucky enough to visit Montreal while the Souk was up and was amazed at the quality of the food that was served. An amazing array of dishes was on offer, from crepes and grilled cheese sandwiches to maple ice cream and gourmet popsicles. 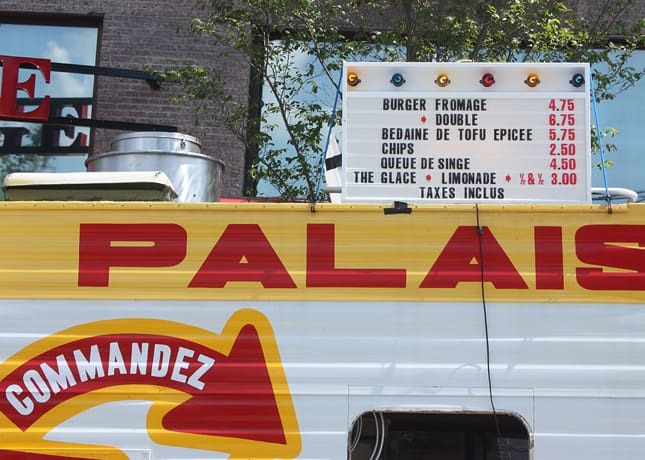 Many of the city’s most creative chefs joined in, such as Martin Juneau and Louis-Philippe Breton of Pastaga, who repurposed a 1980s ice-cream truck, and Gita Seaton of Nouveau Palais, who served inventive burgers from a second-hand Winnebago. Beverages were not neglected; beer and cocktails were served, as well as gourmet coffees and teas. If I’d had the chance to live in Montreal for those two weeks, I probably would’ve visited the Souk every day, lunch and dinner, for the chance to taste everything! 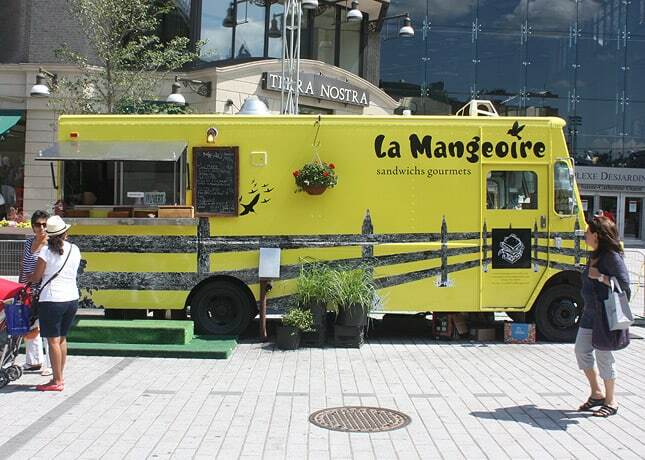 La Mangeoire’s truck, selling gourmet sandwiches. 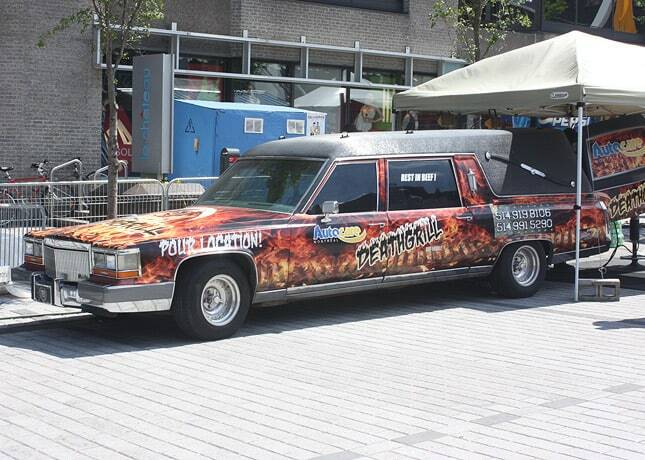 Probably the most photographed “truck” at the Souk: Death Grill, fitted in a hearse (!). Rest in beef indeed. I read so many positive reviews from other bloggers that I can fairly say that all the food on offer was great, but I personally fell hard for two dishes: Squid and Shiitake Takoyaki from Takoyaki Montreal and the cheeky Tofu Belly served by Nouveau Palais. Takoyaki is a ubiquitous street snack in Japan. Pieces of squid or octopus, pickled ginger, and green onions are bound together by a wheat-flour batter and cooked in a special takoyaki pan that produces perfectly round fritters. 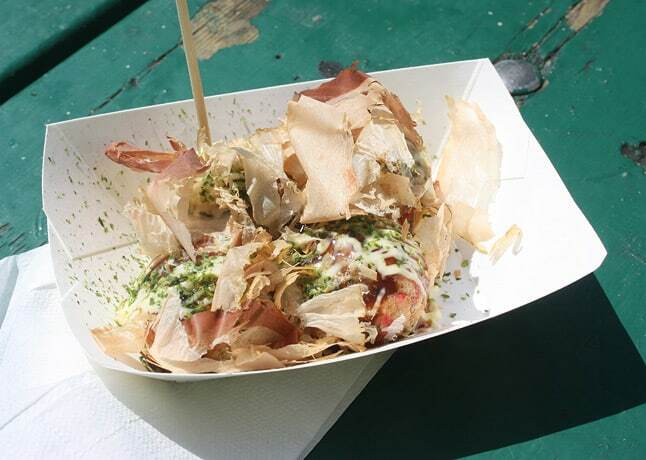 These are served piping hot, drizzled with takoyaki sauce (similar to teriyaki) and Japanese mayo, and sprinkled with dried seaweed and bonito flakes. The last time I had takoyaki was in Osaka, so I couldn’t believe my eyes when I saw pictures of this savory delight posted by on Instagram by a fellow blogger. Of course Takoyaki Montreal had to be my first stop at the Souk, and I wasn’t disappointed—in fact, Montreal’s takoyaki may have tasted even better than the one I had last in Japan. Perhaps it has to do with the fact that they were made with more care (possibly because there wasn’t a 30-person line of people waiting to have their share, as there often is at takoyaki stands in Japan), but the fritters were absolutely perfect, crisp on the outside, pillowy on the inside, and doused in just the right amount of sauces and flavorings. Nouveau Palais’s tofu belly was another very tasty discovery. I asked the order taker what it was, and she told me it was a play on the ubiquitous pork belly sandwich (which was served by many vendors at the Souk) in which pork was replaced by grilled tofu. Although other vendors were serving many sinful dishes, I opted for this “healthier” option. But let me tell you, the sandwich was anything but boring. The tofu was in fact tofu skin, a rarity outside Japan, which instantly made the dish more exciting. A spicy habanero marinade coated the tofu skin, which was grilled and then piled into the bread and topped with a sliced of grilled pineapple, which provided a delightful sweet kick, and tons of crisp lettuce leaves. Each bite provided so much flavor that I couldn’t stop myself; I wolfed down the whole sandwich in record time. It was a truly memorable dish, one that will make me hunt down Nouveau Palais’s truck on future visits to Montreal. 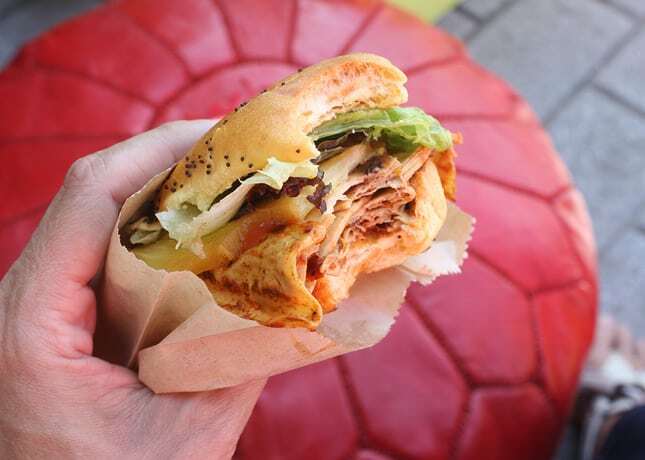 The spicy tofu belly burger: a flavor bomb. This first encounter with Montreal’s food trucks convinced me that the city truly deserves its spot on the street-food map—as soon as possible please! Perhaps gourmet trucks will have to cohabit with hot dog stands, but you know, I think the most creative and delicious options will end up prevailing. 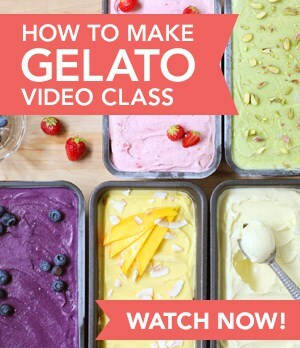 This is certainly just the tip of the edible iceberg. Once the law changes, I’m sure many more chefs will want to invest in new food-truck ventures or create mobile versions of their restaurants. Until then, here’s a list of food trucks/kiosks that were present at the Souk. 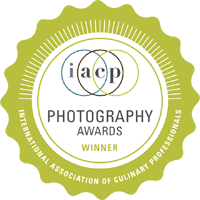 Make sure to check out their sites, Twitter feeds or Facebook pages if you come to Montreal. Many also have restaurants where you can go and enjoy their delicious creations without having to chase the (elusive, for now) trucks. Note: If I forgot someone, please tell me in the comments below! 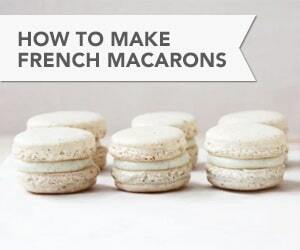 Note: They have a permanent serving counter at Faubourg Ste-Catherine, open Monday-Friday 11:30am-8pm. Note: Owned by chefs of renowned restaurant La Salle à Manger. Death Grill – No website/Twitter/Facebook yet! Note: Nouveau Palais is also a restaurant serving traditional comfort food. Hot Bulldog – No website/Twitter/Facebook yet! Dada Cones – No website/Twitter/Facebook yet! Savory cones filled with gourmet meats and veggies. 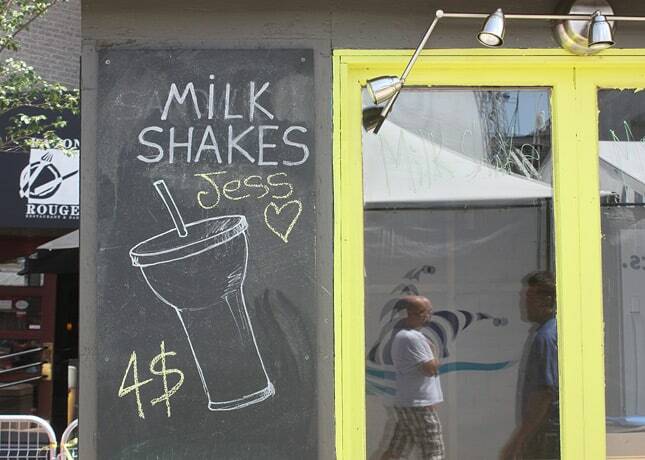 Also: milk shakes and ice cream sandwiches. 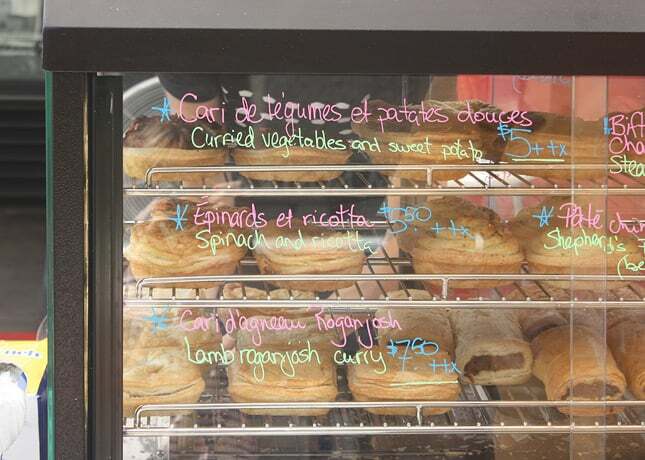 Gourmet savory pies of Australia and New Zealand by Tourtière Australienne. 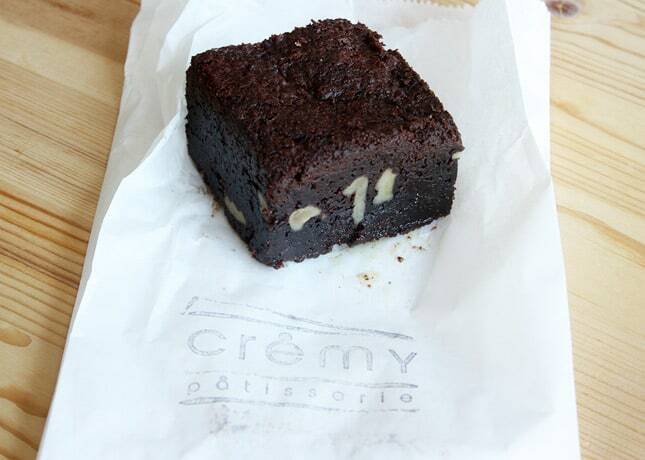 CRémy Pâtisserie’s sinful 1/4 lb. brownie. 2 Responses to Who Said There’s No Street Food in Montreal? 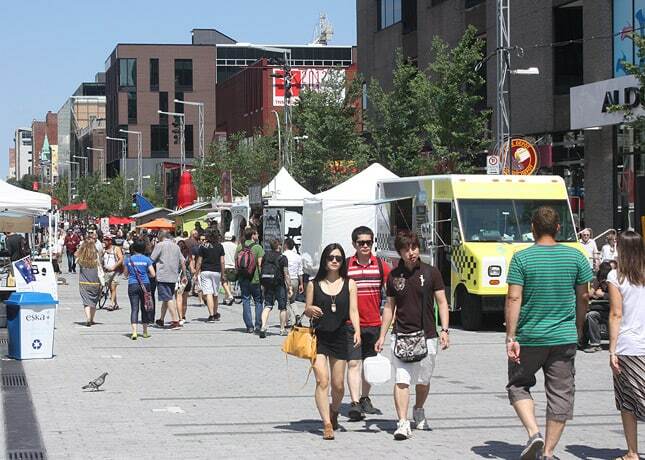 I had no idea street food was currently outlawed in Montreal — how fascinating! 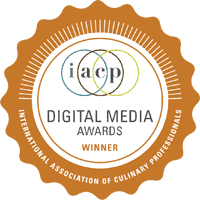 I have mixed feelings about the trend, though I do think it’s a fantastic way for young chefs to reach customers. Aren’t takoyaki delicious? I also love the agitating iron in which they’re cooked. I was definitely surprised the first time I saw one! 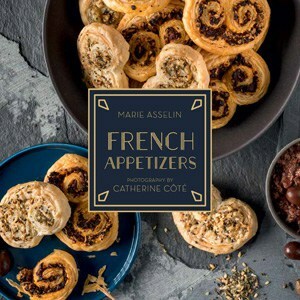 Right now in Montreal, those pushing for the law to change are the younger, more innovative chefs, so this makes the city’s gourmands believe that the offering will be of a high standard. For sure, once the law changes, I’m sure it’ll bring about its share of less appealing food carts too. Visiting cities where street food is permitted never bothered me though, so I’d be curious to know what you don’t like about it (I’m sure you’ve had more experience with it on a long term basis!). Takoyaki are AMAZING. I certainly wish I could indulge in those more frequently!